Would my path have been all that different had I started on a tamper-resistant opioid medication? Would it have spared me, and those close to me, the pain we experienced? No matter how many times I run scenarios in my head, I consistently find myself coming up with the same answer... and that answer is 'No'. I personally don't support the push for tamper-resistant opioids. I'm sure there's plenty of you who will vehemently disagree with me on this subject. Some tout tamper-proofing as a logical step in which will help reduce risk of addiction, and reduce street supply of 'abuse-able' opioids, among other things. I personally don't quite see it that way, though, and I'm not the only one. An article recently published in the Canadian Medical Association Journal entitled "Tamper-resistant drugs cannot solve the opioid crisis" calls out tamper-proofing as nothing more than a "gimmick in the fight against Canada's growing opioid crisis." ​Interestingly, despite the switch to the tamper-resistant OxyNeo in 2012, opioid-related deaths in Ontario have continued to rise. By the year 2013, prescriptions for "other narcotics such as hydromorphone and fentanyl increased by 79% and 20%, respectively". 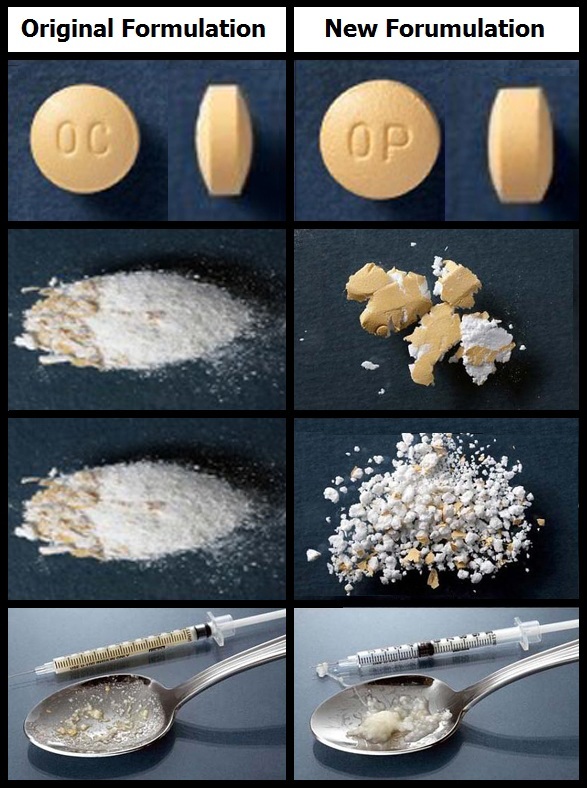 In the above images of the original formulation (left - OxyContin), the outer casing is left on. This is not how a user would prepare the pill. The outer casing/coating is easily removed prior to crushing and mixing with water. It is unsafe to inject the coating. With OxyContin no longer on the market, patients struggling with abusing their medication (and recreational users) were forced to find other options. For many, that meant migrating to a different, often times more dangerous drug (such as heroin, or fentanyl). Another drug that become a popular option post OxyContin is HydromorphContin (hydromorphone); which is being associated with severe heart-valve infections amongst intravenous users. Since OxyNeo's arrival, we've also seen an influx of illicit Fentanyl and other synthetic opioid drugs, along with Crystal Methamphetamine. Not quite the intended effect. ​This change left many without a safe pharmaceutical option. Unlike OxyContin, HydromorphContin does not entirely dissolve when mixed with water for injection, which can lead to serious health problems. Illicit Fentanyl pressed into counterfeit Pills or added to Heroin makes knowing the dosage near impossible, increasing ones chances of overdose. But back to my original question. Would things be different for me had I initially been prescribed something tamper-resistant? I was abusing my medication long before I began attempting to crush, snort and inject it. Not being able to do so effectively wouldn't have stopped me. I would have attempted to do it anyways, which could lead to damaged veins and other health problems. Once that failed, I would simply have found myself a different opiate. In fact, I believe that had I initially been started on tamper-resistant opioid medication, it would have pushed me on to the street even sooner, and led me to experiment with potentially more harmful drugs. Before I was 'tampering' with my medication; the high I got from simply swallowing them was plenty at the beginning. The issues that lead me to abuse my medications in the first place existed regardless of which formulation I was prescribed. The trauma and emotional damage that was relieved by that warm, fuzzy feeling of opiates wouldn't have been stopped by a tamper-resistant medication. I do understand the desire to stop others from experiencing the pain of opioid addiction. I don't doubt that those pushing tamper-resistant opioids want to help; however, I believe it is a misguided and ill informed attempt at doing so. People are going to use drugs and experience addiction regardless of how we attempt to legislate opioid medications. It is imperative that rather than continue a failed war on drugs and drug users, that we wholeheartedly support harm reduction initiates, treatment options, and accessible mental healthcare. We need to ensure we are providing safe options, and not inadvertently harming those whom we are trying to help.